Bajaj India has launched the much awaited New Bajaj Pulsar 135 LS (Light Sport).Pulsar 135 LS features the same headlight as seen in the XCD Sprint Concept shown at the Auto Expo, 2008 in New Delhi. Bajaj had recently launched the updated versions of Pulsar 150, Pulsar 180 & Pulsar 220. 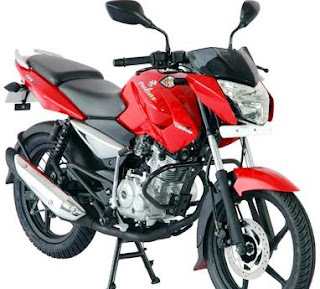 Also the Pulsar 200 was discontinued recently, so the main reason of launching Pulsar 135 LS is that they want to eat into the sales of Honda CBF Stunner. Pulsar 135 LS has been launched with a price tag of Rs. 51000.00 (Ex-Showroom) which is very reasonable in comparison to the features on offer and also the 135cc engine is more powerful in comparison to the engine of XCD 135. It is styled aggressively, the motorcycle draws styling cues from its elder siblings in the Pulsar range, but sports a freshly-styled fuel tank with chiseled lines and fresh tank flanks. The headlamp unit sports with sharp looking,looks stylish. The sleek rear-panels give way to a two-piece split grab rail on the split type seat. The foot rests are slightly rear-set, and make for a sporty riding position in combination with the two-piece handle-bars. Bajaj has gained a stronghold over Indian market by launching the Pulsar bikes.They got huge response and attention.My favorite is 135cc pulsar which is economical.